Georgia Trend magazine annually publishes a list of lawyers most respected by their peers for professionalism and subject matter expertise. 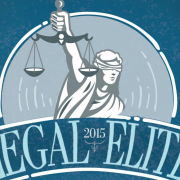 Bobby was named “Legal Elite” in the areas of probate litigation and commercial litigation. In July, Bobby attended the Fiduciary Law Institute at Saint Simons Island. This yearly seminar is integral to staying current on recent developments in estate planning and litigation, probate and fiduciary law.